The photograph shows research SCFE Plant (Lab Scale Units). We can also offer the research plant as table top compact unit. - Supercritical Fluid Extraction (SFE) system uses supercritical carbondioxide (CO2) as solvent instead of any organic solvent. There's nothing "critical" about supercritical. "Supercritical" is a thermodynamic expression describing the state of a substance where there is no clear change of state between the liquid & the gaseous phase. Water reaches this state at a pressure above 22.1 Mpa. 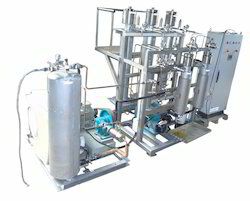 Owing to our enriched industrial experiences, we are devoted towards manufacturing a wide variety of excellent quality Super Critical Fluid Extraction Plant. Waters’ Supercritical Fluid Extraction (SFE) Systems extract chemical compounds using supercritical carbon dioxide instead of an organic solvent. The supercritical fluid state occurs when a fluid is above its critical temperature (Tc) and critical pressure (Pc), when it is between the typical gas and liquid state. In its supercritical state, CO2 is an extremely efficient solvent because of its selectivity and speed. It is widely used in extracting oils, flavours, aromas and other essentials from spices, other food stuff and also industrial chemicals. The Nexera UC SFE-SFC-MS platform unifies quick and easy on-line sample preparation with state-of-the-art chromatographic analysis and high sensitivity detection. The system uses a supercritical fluid to extract components (SFE) from the sample and then directly analyzes them online by supercritical fluid chromatography (SFC). Super critical extraction is used in extraction and separation of essential oils, pigments and other compounds from plants. We offer Job Work for Essential Oils and Total Extracts by SCFE System. We have 150 litres capacity plant. The SFT110 Supercritical Fluid Extractor (SFE) is an entry level system which possesses many features typically found in more costly SFE equipment. It may be used for a variety of applications from routine analytical work to basic process development.